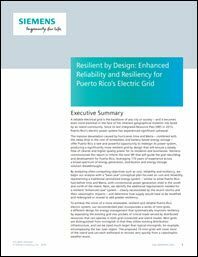 Siemens commissioned this report on mini-grids to inform the next IRP that will guide the grid rebuilding and development for Puerto Rico, leveraging 170 years of experience across a broad spectrum of energy generation, distribution and energy storage solution breakthroughs. By analyzing often-competing objectives such as cost, reliability and resiliency, we begin our analysis with a “base case” conceptual plan focused on cost and reliability, representing a traditional centralized energy system – similar to what Puerto Rico had before Irma and Maria, with conventional power generation sited in the south and north of the island. Next, we identify the additional requirements needed for a resilient “enhanced case” system – clearly necessitated by the recent storms and their catastrophic impacts – and determine how supply would have to be modified and redesigned or moved to add greater resiliency. To achieve the vision of a more renewable, resilient and reliable Puerto Rico electric system, our recommended plan incorporates a series of mini-grids, a different design for energy management that systematically improves resiliency by separating the existing grid into pockets of critical loads served by distributed resources that can operate in both grid-connected and island modes. Mini-grids are distinguished from microgrids in that they utilize existing distribution infrastructure, and can be sized much larger than typical microgrids, for example, encompassing the San Juan region. The proposed 10 mini-grids will cover most of the island and can each withstand or recover very quickly from a catastrophic weather event.